The radiocarbon content (∆14C) of the large brown macroalga Undaria pinnatifida was investigated as an indicator of oceanographic conditions during algal growth in Otsuchi Bay on the Pacific coast of northeastern Japan. In this region, warm boundary currents characterized by high dissolved inorganic carbon (DIC) ∆14C and cold subarctic Oyashio Current (low ∆14C-DIC) flow into the bay seasonally. We hypothesized that ∆14C values in U. pinnatifida pinnae (leaflet-like structures arising sequentially along the vertical axis of the blade) reflect ∆14C-DIC values in bay water during photosynthetic production. During the U. pinnatifida cultivation period (November 2013–April 2014), the Oyashio intrusion occurred from early March to early April, accompanied by a decrease in bay water ∆14C-DIC, from 15.7 ± 8.6‰ to − 57.1 ± 20.7‰. The ∆14C of the pinnae reflected ∆14C-DIC, as pinnae that formed in early March had significantly higher ∆14C (3.0 ± 5.4‰) than those that formed in early April (− 23.6 ± 7.5‰). These results indicate that the ∆14C of U. pinnatifida pinnae can serve as a record of Oyashio intrusion into the bay during algal growth. The radiocarbon content (∆14C) of dissolved inorganic carbon (DIC) in surface seawater is influenced by upwelling because there is less 14C in deeper water than in surface water (Key 2001). For example, in the coastal upwelling region of California, there was a decrease in ∆14C-DIC from 42 to 26‰ during active upwelling in 2006 (Santos et al. 2011). ∆14C signals during upwelling are transferred to biogenic carbonates present in hard tissues such as bivalve shells, thus providing a temporal record of the strength of upwelling (Douka et al. 2010; Santos et al. 2011; Ferguson et al. 2013). Because DIC is fixed by photosynthesis, the soft tissues of primary producers such as macroalgae might also reflect the ∆14C-DIC of upwelled waters and serve as an indicator of oceanic conditions during their growth. Such information could be useful for assessing the influence of oceanic conditions (upwelling strength and current regimes) on macroalgal growth and distribution. However, to the best of our knowledge, no previous studies have examined whether the ∆14C of macroalgal tissues record changes in ∆14C-DIC in the surrounding seawater during their growth. In this study, we examined the ∆14C of the large brown macroalga Undaria pinnatifida (Laminariales) growing in an embayment of Otsuchi Bay on the Sanriku coast of northeastern Japan (Fig. 1a). Undaria pinnatifida is extensively cultivated in this region, and previous studies have examined the nutrient sources, photosynthetic rates, and other physiological parameters of this kelp species (e.g., Yoshikawa et al. 2001; Carvalho et al. 2009; Gao et al. 2013b; Endo et al. 2017, 2018). The current system comprises the Kuroshio subtropical western boundary current, the Tsugaru Warm Current, and the subarctic cold Oyashio Current (Hanawa and Mitsudera 1987; Shimizu et al. 2001; Oguma et al. 2002; Ishizu et al. 2017). Because the Oyashio Current originates from high latitudes of the North Pacific, where 14C-depleted deep water is upwelled, Oyashio waters have substantially less 14C (∆14C-DIC: − 60 to − 10‰) than the Tsugaru Warm Current waters and Kuroshio waters (∆14C-DIC: 20–40‰); in the latter, ∆14C-DIC is strongly influenced by the uptake of 14C derived from atmospheric nuclear bomb testing in the 1970s (Key 2001; Kumamoto et al. 2002; Key et al. 2004; Ge et al. 2016). Undaria pinatifida sporophytes grow rapidly in winter (Yoshikawa et al. 2001), when the prevailing oceanic current changes from the warm current to the Oyashio Current (Ishizu et al. 2017). New pinnae (leaflet-like structures) on sporophytes are synthesized near the meristem, which is located near the bottom of the thallus (Fig. 2). As the thallus grows, it expands upwards and a pair of new pinnae form below the older ones. Thus, the positions of pinnae along the major axis of the thallus represent the pinna formation chronology. In this study, we tested the hypothesis that the ∆14C of U. pinnatifida pinnae reflects the ∆14C-DIC in bay water during photosynthetic production by each pinna. To test this hypothesis, U. pinnatifida seedlings were outplanted in Otsuchi Bay, and the ∆14C variability at different pinna positions was examined in relation to temporal changes in bay water salinity, temperature, and ∆14C-DIC levels. Undaria pinnatifida cultivation was conducted in Otsuchi Bay (length: 8 km, width: 2–4 km, depth 9–60 m), a semi-closed bay open to the northwest Pacific Ocean. Oceanic conditions in the bay are related to the coastal ocean outside of the bay due to rapid water exchange between the bay and open ocean (Otobe et al. 2009; Ishizu et al. 2017; Tanaka et al. 2017). Between October and February, the bay water is generally under the influence of the Tsugaru Warm Current, and the intrusion of Oyashio water occurs between February and April (Ishizu et al. 2017; Tanaka et al. 2017). Three rivers (the Otsuchi, Kozuchi, and Unozumai) flow into the bay with a total discharge of 3–35 m3 s−1 (Ando et al. 2005). Sporophyte seedlings were obtained from a local fisherman (the general method used for the preparation of sporophyte seedlings was described in Endo et al. 2017) and were outplanted on November 21, 2013, at three stations in Otsuchi Bay (Fig. 1a). At each station, sporophytes (> 2 cm) were attached to a seeded string that was wrapped around a vertical cultivation rope and suspended at a depth of 1–3 m (Yoshikawa et al. 2001). A temperature–salinity logger (Infinity-CTW; JFE Advantech Co, Ltd., Japan) was attached to the line at a depth of approximately 3 m to collect seawater temperature and salinity data every 10 min. On March 3, 2014, a hole (diameter: 5 mm) was punched into the thallus near the meristematic region as a marker of sporophyte growth (Mann 1973; Yoshikawa et al. 2001; Fig. 2b). Undaria pinnatifida individuals (thallus length: 105–175 cm) were harvested on April 8, 2014 (138 days after outplanting) at stations (Sts.) A2 (n = 2), A3 (n = 3), and A7 (n = 3) (individual codes are listed in Table 1). We conducted transect sampling for ∆14C analyses in four haphazardly selected individuals (S1, 3, 4, and 6), on 13–20 pinnae positioned between the hole (upper pinnae) and meristem (lower pinnae) (Fig. 2). In four additional individuals (S2, 5, 7, 8), we conducted two-point sampling, removing only pinnae positioned near the punch hole and near the meristem. Sampling was conducted by removing the top 5 cm of the pinnae (width: ca. 2 cm, length: 5–30 cm) using scissors. where L1 is the distance (cm) between the punch hole and the base of pinna A, L2 is the distance (cm) between the meristem and the base of pinna A, and the M is the average value of L1 + L2 for four individuals (mean and standard deviation: 66.2 ± 8.6 cm). Seawater samples were collected in Otsuchi Bay at depths of 1 and 3 m on January 21, March 3, and April 8, 2014. 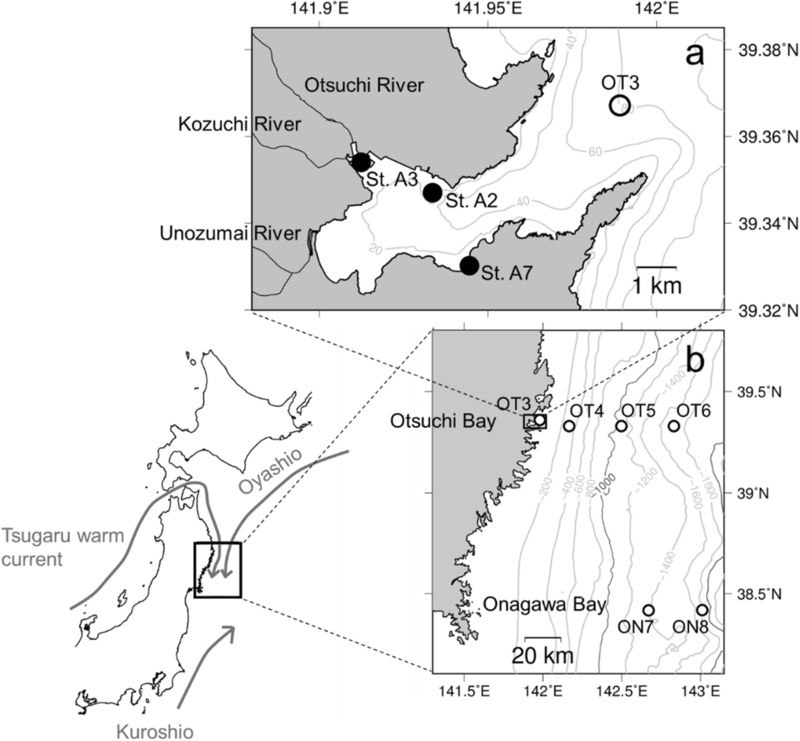 River water samples were collected at the mouths of the Otsuchi, Kozuchi, and Unozumai rivers where they flowed into the bay (Fig. 1a) on January 22, March 3, and April 12, 2014. To examine the water mass distribution along the Snariku coast during the study period, we also collected offshore water using the R/V Shinsei-Maru on March 16 and 17, 2014, along transects from river mouths to offshore of Otsuchi Bay (OT3–6) and offshore of Onagawa Bay (south of Otsuchi Bay, ON7 and ON8) (Fig. 1b). Samples were collected from 2–6 depths at each station. River water samples were collected using a plastic bucket and stored in 500 mL glass bottles with plastic caps. Seawater (bay and offshore) samples were collected using 12-L or 5-L Niskin bottles, except that a plastic bucket was used to collect surface water. Seawater samples were stored in 100 mL glass vials with rubber stoppers. River and seawater samples were preserved with HgCl2; a saturated aqueous solution of HgCl2 was added to the sample at a volumetric ratio (HgCl2:sample) of 1:1000. Macroalgal samples were acidified overnight by fumigating with HCl in centrifugation tubes to remove inorganic carbon. After removing excess HCl using a vacuum desiccator, dried samples were combusted in evacuated quartz tubes containing copper oxide and Sulfix for 30 min at 500 °C, followed by oxidation to CO2 for 2 h at 850 °C. Then CO2 was purified in a vacuum line for graphitization. Seawater (230 mL) or river water (570 mL) samples were acidified by adding 85% H3PO4 and bubbled with helium (ultrahigh-purity grade) for 15 min to strip CO2 from the water (McNichol et al. 1994). Extracted CO2 was purified in the vacuum line and reduced to graphite powder following the method of Yokoyama et al. (2007). The DIC concentrations of seawater and river water were calculated from the pressure of CO2 gas extracted from the vacuum line for the graphitization (McNichol et al. 1994). We determined ∆14C using a single-stage accelerator mass spectrometer (National Electrostatics Corporation, USA) at the University of Tokyo Atmosphere and Ocean Research Institute (Yokoyama et al. 2019). The ∆14C values are reported as sample 14C/12C ‰ deviations relative to the 95% Oxalic Acid-1 standard following the conventional standardization procedure to correct for isotope fractionation and 14C decay (Stuiver and Polach 1977). The analytical precision (1σ) of the measurements ranged from 0.3 to 0.8%. Statistical analyses of ∆14C data were conducted using Student’s t test or two-way analysis of variance (ANOVA) at a level of p < 0.05 after confirming that the data met the normality (Shapiro–Wilk test) and equal variance (Bartlett test) assumptions. When these assumptions were not fulfilled, nonparametric tests (the Kruskal–Wallis test followed by the Steel–Dwass multiple comparison test or Spearman’s rank correlation analysis) were conducted. All statistical analyses were performed using R v.3.3.2 (R Development Core Team 2016). In Otsuchi Bay, seawater temperature gradually decreased from late November (15 °C) to early March (6.7 °C) (Fig. 3a). At Sts. A2 and A3, salinity did not significantly change between November 22 and March 5, with an average value of 33.5 ± 0.13. Salinity markedly decreased from March 6 to early April, accompanied by a decrease in temperature (Fig. 3b). At St. A7, general trends in seasonal salinity and temperature were similar to those at other stations, except for the presence of short-term (timescale of a few days) fluctuations in salinity and temperature (Fig. 3a, b). Both temperature and salinity were generally lower at St. A7 than at Sts. A2 and A3 (Fig. 3a, b). In bay water, the mean ∆14C-DIC values were 17.5‰ ± 6.1‰ and 15.7‰ ± 8.6‰ on January 21 and March 3, respectively, and differences between the values obtained for those dates were not significant (p > 0.05) (Table 2). The mean ∆14C-DIC of seawater on April 8 (− 57.1‰ ± − 20.7‰) was significantly lower than the corresponding values on January 21 and March 3 (p < 0.05, Table 2). The ∆14C-DIC offset between March 3 and April 8 was 72.8‰. The DIC concentration in bay water was in the range 1.92–1.97 mM, changing little over time (Table 2). The ∆14C-DIC and DIC concentrations in river water ranged from − 35.3 to 8.9‰ and from 0.33 to 0.53 mM, respectively (Table 3). In seawater off Otsuchi Bay (OT Sts. OT3–5), a cold (1.5–4.1 °C) and low-saline (32.7–33.5) water mass prevailed at depths of 0–200 m. Warmer (7.0–8.1 °C) and saltier (33.5–33.7) waters were prevalent in the region approximately 60 km south of the OT stations (off Onagawa Bay, Sts. ON7–8; Fig. 4a, b, Table 4). Values of ∆14C-DIC in the upper water column (depth: 0–200 m) of the OT stations ranged from − 73.7 to − 10.0‰, whereas corresponding values for seawater collected at ON stations were higher, ranging from − 9.6 to 8.1‰ (Fig. 4c, Table 4). The ∆14C-DIC values of seawater collected at a depth of 1000 m ranged from − 192 to − 199‰ (Table 4). Data collected using the transect and two-point sampling methods were used to obtain mean ∆14C values for upper (old) and lower (young) U. pinnatifida pinnae. Depending on the station, mean ∆14C values of the upper and lower pinnae ranged from 1.2 to 5.9‰ and from − 25.4 to − 21.2‰, respectively (Table 5). To examine the significance of the differences in ∆14C values among stations and between positions, two-way ANOVA was conducted using station and position as two fixed factors. The results showed that ∆14C values differed significantly (p < 0.05) between positions (upper versus lower pinnae), whereas the difference among stations (A2, A3, and A7) was insignificant (p > 0.05). For the pooled data, the mean ∆14C of the upper pinnae (mean ± SD: 3.0 ± 5.4‰) was significantly lower than that of the lower pinnae (− 23.6 ± 7.5‰), with an offset value of 26.6‰ (p < 0.0001, Student’s t test) (Table 5; Fig. 5). 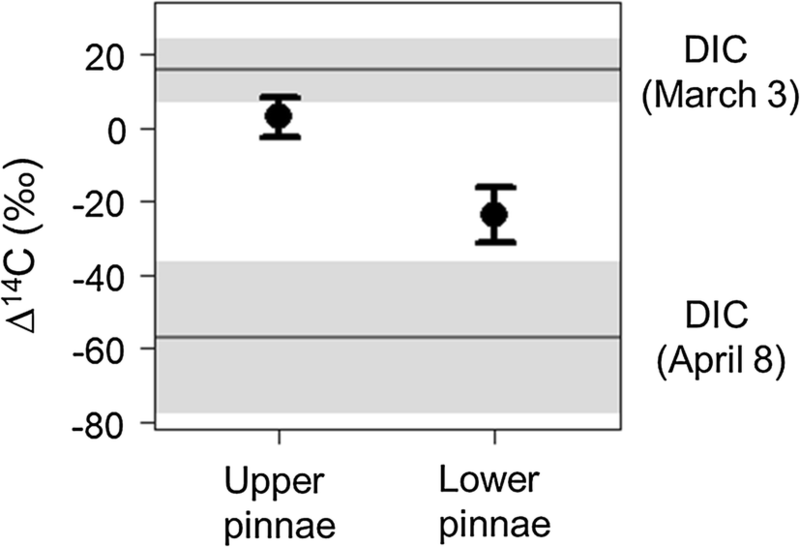 The results of pinna transect sampling revealed a decreasing trend in ∆14C from the upper (near the punch hole) to the lower (near the meristem) pinnae (Fig. 6). The correlation between pinna position and ∆14C was significant for four individuals (rs = − 0.579 to − 0.863, p < 0.05) and the pooled data (rs = − 0.619, p < 0.001) (Table 6). The most important finding of this study is that the ∆14C of pinnae displayed systematic position-dependent variability, with an offset of 26.6‰ between pinnae formed in early March and those formed in early April. We argue that this ∆14C shift in U. pinnatifida pinnae tissues reflected changes in oceanic current conditions in the bay. The decreasing trend in salinity and temperature in the bay between March 6 and April 8 was primarily a consequence of the Oyashio intrusion during this period. This assertion is supported by the results of Ishizu et al. 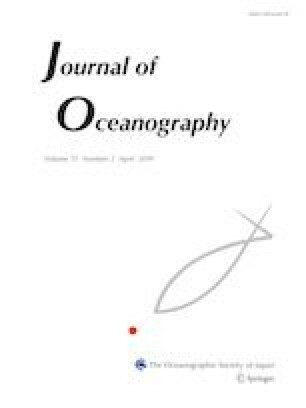 (2017) from a time series of mooring and hydrographic observations at the mouth of Otsuchi Bay; a prominent low-salinity event occurred between early March and April, 2014. Satellite imagery showed that cold Oyashio water gradually moved north to south to cover the Sanriku coast north of 39°N in early March, including the area outside of Otsuchi Bay (Ishizu et al. 2017). These results indicate that the low-salinity event was caused by the intrusion of Oyashio water from offshore. Although marked decreases in both salinity and temperature were observed in the current study after March 6 at the three stations, salinity was generally low at St. A7 (south of the bay), with short-term large-amplitude fluctuations. The river plume was directed southward due to the Coriolis force in the Otsuchi Bay, and low-salinity fluctuations at St. A7 appear to have been caused by river discharge (Ishizu et al. 2017). The substantial decrease in ∆14C-DIC from 16.6‰ (January 21 and March 3) to − 57.1‰ (April 8) in the bay can be explained by the gradual mixing of 14C-rich seawater of subtropical origin with 14C-depleted Oyashio water. Consistent with this notion, our data collected at OT stations during mid-March showed that the 14C-depleted water mass (∆14C-DIC: − 73.7 to − 10.0‰) was indeed prevalent in the surface layer (0–200 m depth) near the mouth of the bay (Fig. 4, Table 4). This water mass was characterized by low temperature (1.5–4.1 °C) and low salinity (32.7–33.3) indicative of Oyashio or Oyashio-influenced coastal Oyashio water according to the Sanriku water mass classification proposed by Hanawa and Mitsudera (1987), and therefore may have been a source of the 14C-depleted water that intruded into the bay. Values of ∆14C-DIC were higher at ON stations than at OT stations, suggesting that 14C-depleted waters moved from north to south as the Oyashio gradually moved southward after early March in areas offshore the Sanriku coast. The presence of 14C-depleted deep water (depth: 1000 m) with an estimated radiocarbon age of ca. 2000 years in this region is consistent with the results of previous studies (see McNichol and Aluwihare 2007). In this model, f is the maximum potential fraction of river water in the bay water samples collected on April 8, which was calculated using the following equation: f = (Sal1 − Sal2)/(Sal1) (estimated range of f: 0.016–0.034). [DICr] and ∆14C-DICr represent the DIC concentration and ∆14C-DIC of river water, respectively [to determine these parameters, the maximum DIC concentration of 0.53 mM (Table 3) and the lowest Δ14C-DIC value of − 35.3‰ (Table 3) were used to evaluate the maximum influence of river water on Δ14C-DIC in the bay]. [DIC1] and ∆14C-DIC1 represent the DIC concentration and ∆14C-DIC of bay water collected on 3 March, respectively (these parameters were set to 1.92 mM and 15.7‰, respectively, based on the data presented in Table 2). [DICmix] and Δ14C-DICmix are the estimated DIC concentration and the estimated Δ14C-DIC value, respectively, of “virtual” water obtained by mixing the bay water collected on March 3 with river water at a mixing ratio of f ([DICmix] = f[DICr] + (1 − f)[DIC1]). We estimated that Δ14C-DICmix is in the range 15.2–15.5‰, with an offset value relative to Δ14C-DIC1 of 0.2–0.5‰. This offset value is much smaller than the ∆14C-DIC offset observed in the bay (72.8‰). As the model described above assumed that the decrease in salinity was solely caused by river discharge (thus providing the maximum potential influence of river water on DIC dynamics in the bay), we conclude that river discharge had little effect on temporal variability in bay water ∆14C-DIC. Undaria pinnatifida pinnae displayed systematic position-dependent variability in ∆14C, with a tendency for 14C depletion from older to newly formed pinnae. The most likely explanation for this tendency is a shift in the prevailing current from the warm current to the cold Oyashio Current during U. pinnatifida growth. On March 3, bay water DIC was relatively enriched in 14C, such that the ∆14C of upper pinnae was relatively high. As the Oyashio intrusion progressed, bay water DIC became depleted in 14C, leading to a decrease in ∆14C in the lower pinnae, which were produced in early April. Thus, the ∆14C distribution in the pinnae recorded the ∆14C shift of ambient DIC associated with changes in the prevailing ocean current. The ∆14C values of macroalgal photosynthates directly reflect the source ∆14C-DIC signature because ∆14C, by definition, is corrected for isotope fractionation during carbon assimilation and other metabolic processes using the δ13C value (Stuiver and Polach 1977; McNichol and Aluwihare 2007). Therefore, the effects of isotope fractionation can be ignored in the interpretation of ∆14C variability in and among organisms. However, ∆14C variability among U. pinnatifida pinnae should be interpreted with caution because of potential mixing of “old” and “new” photosynthates through metabolic processes. In this study, mean ∆14C values in upper pinnae (3.0 ± 5.4‰) were lower than the ∆14C-DIC value on March 3 (15.7 ± 8.6‰), and those in lower pinnae (− 23.6 ± 7.5‰) were higher than the ∆14C-DIC value on April 8 (− 57.1 ± 20.7‰) (Fig. 5). Thus, differences in ∆14C values before and after the Oyashio intrusion were greater for DIC than for pinnae. Deviation of the mean Δ14C values of pinnae from the corresponding Δ14C-DIC values and apparent attenuation of the isotopic offset for pinnae relative to DIC could be explained by carbon turnover (Carballeira et al. 2014). Pinnae formed in the warm current (high ∆14C) were later exposed to the cold current (low ∆14C), which may have resulted in the mixing of preexisting carbon (high ∆14C) and newly formed carbon (low ∆14C) within a single pinna. Although carbon that is newly fixed by older pinnae is translocated to the meristem to support the formation of younger pinnae (Wu and Meng 1997), the mixing of old and new carbon can still occur due to tissue carbon turnover. For a quantitative assessment of the contributions of different currents to the supply of DIC for pinnae synthesis, the effect of carbon turnover on the ∆14C signature of pinnae must be evaluated in future research. It is also important to consider the timescale of blade growth. Undaria pinnatifida pinnae elongate from the base (Nishikawa 1974). Previous studies conducted in Otsuchi Bay reported elongation rates of the U. pinnatifida thallus on the order of 1–3 cm/day in March (Saitoh et al. 1999; Yoshikawa et al. 2001). Using this elongation rate, the time required for the formation of the top 5 cm of the pinna (the part examined in this study) is estimated to be on the order of 2–5 days. Therefore, the ∆14C of each matured pinna may reflect the ∆14C-DIC of ambient water integrated over a period of 2–5 days. This time integration of the isotopic signature may contribute to the attenuation (smoothing) of isotopic variability in U. pinnatifida relative to the corresponding variability in ∆14C-DIC. We demonstrated that ∆14C in U. pinnatifida pinnae reflected a shift in exposure from a warm current to the cold Oyashio Current during algal growth. Despite the potential influence of tissue turnover, our data clearly show systematic position-dependent variability in ∆14C in U. pinnatifida. The large body size and rapid growth of U. pinnatifida, which produces a pair of pinnae every 1 or 2 days (Saitoh et al. 1999; Yoshikawa et al. 2001; Gao et al. 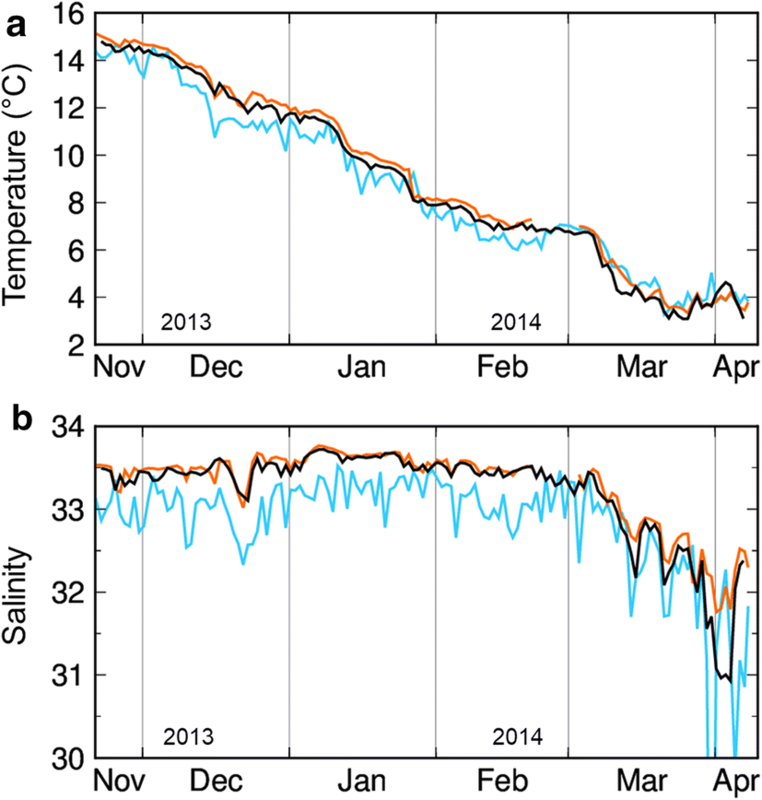 2013a), allow us to use its position-dependent variability in ∆14C as a unique tool to reconstruct oceanographic conditions experienced by macroalgae during growth. This finding has several important implications for future research. First, determining ∆14C could improve the interpretation of variability in other macroalgal isotopic indicators (e.g., δ13C as an indicator of algal growth rate, Carvalho et al. 2009; δ15N as an indicator of nitrogen source, Derse et al. 2007), growth measures (thallus length and weight, Yoshikawa et al. 2001), or biochemical indicators (e.g., carbon and nitrogen contents, pigment concentration and composition, Carvalho et al. 2009), facilitating the accurate assessment of relationships between oceanographic conditions and macroalgal physiology. Such information is particularly useful for industrial implications in the Sanriku region, where Oyashio intrusion may seriously affect the growth and physiology of commercially cultivated kelp in a complex manner; e.g., enhancement of productivity (yield) due to the supply of nutrients (a positive effect; Gao et al. 2017) combined with possible discoloration due to low-temperature-induced inhibition of the synthesis of some photosynthetic pigments (a negative effect, as discoloration reduces the commercial value of kelp; Endo et al. 2017). Second, ∆14C data from macroalgal tissues in preserved samples (e.g., pressed macroalgal samples in museums) could be used to reconstruct past changes in the conditions of oceanic currents. Third, as macroalgal ∆14C signatures should transfer to consumers, the ∆14C of consumers could be helpful for examining the dependency of the food web on carbon from different ocean current systems. Finally, the 14C approach could be applied to other oceanic regions where aged, upwelled water (depleted in 14C) is mixed with 14C-enriched surface waters (e.g., California upwelling system, Santos et al. 2011), and it provides a new tool to better understand the role of oceanographic conditions in sustaining coastal ecosystem productivity. This study was supported by Japan Science Technology Agency CREST grant number JPMJCR13A4, Japan, and the research program “Tohoku Ecosystem-Associated Marine Sciences” of the Ministry of Education, Culture, Sports, Science and Technology. J. Leichter commented on an early draft of the manuscript. H. Takasu, Y. Nishibe, R. Sohrin, and M. Suzuki assisted with field sampling. M. Ishizu and K. Tanaka provided advice on the analysis of physical data. T. Aze assisted with radiocarbon analysis. H. Endoh provided valuable advice on the cultivation of U. pinnatifida. We thank the captain and crew of the R/V Shinsei-Maru and the staff of the International Coastal Research Center, Atmosphere and Ocean Research Institute, University of Tokyo, for support during field sampling.